Northwest Missouri State University football fans will be able to purchase their own piece of Bearcat Stadium turf this summer. 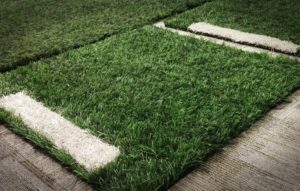 The Department of Athletics will be selling 3×3 and 6×6 pieces of the recently removed turf that saw Northwest go 42-4 overall in nine seasons. Fans can purchase an approximate 3×3 foot piece for $25 or an approximate 6×6 foot piece for $100. These pieces are sold as-is and are on a first-come, first serve basis. There will be no pre-sale for these pieces and only cash or checks made out to the Northwest Foundation will be accepted. Fans must purchase and pick up their piece of the turf at Bearcat Stadum as items will not be available for shipping. A 3×3 piece of the turf weighs approximately 4 lbs. and a 6×6 piece weights 16 lbs. Wednesday, July 27 – 1-5 p.m.
Thursday, July 28 – 1-5 p.m.
Friday, July 29 – 9 a.m. – 2 p.m. The center paw at the 50 yard line has been preserved as whole and will be auctioned off. Details and the date of the auction will be announced at a later time. Bearcat Stadium will remain closed for the duration of the field installation, including the Herschel Neil Track.